My teeth have brown spots. What causes this? Brown spots on teeth may be a sign of tooth decay or tooth enamel demineralization. They may also represent superficial stains—like those produced by coffee, tea, wine, tobacco and food additives. Failing dental restorations (for example: fillings or crowns) often pick up stain at the tooth-restoration interface (margin). 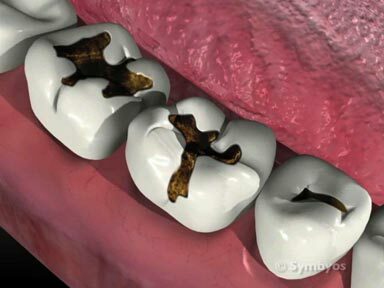 Brown spots which appear deep within the tooth are known as intrinsic stains, and are often the result of treatment with antibiotics while the teeth were forming. Intrinsic stain can also be produced by excess fluoride consumption and events that interrupt the normal formation of tooth structure—like childhood illness or injury. My teeth have brown stains. What can/should I do about it? Learn more about extrinsic stains. Brown stains are usually due to frequent consumption of coffee, tea, or drinks which contain caramel coloring (for example, colas). They are also frequently due to tar, an ingredient in cigarette smoke. Each of these is considered a source of extrinsic stains, and is generally removable through dental prophylaxis, improved hygiene, and avoidance of these types of compounds. Brown stains may also be due to poor oral hygiene, and/or tooth decay. I have yellow teeth. Should I do anything? Yellow teeth usually represent a normal variation in tooth shade, and are generally of no medical consequence. Teeth naturally darken and yellow as they age, because the dentin layer under the enamel shell continues to develop and thicken over the course of the patient’s lifetime. Dentin formation accelerates in response to stresses placed on the teeth, as may occur if you have a long-term tooth grinding habit. This can also produce yellowing. Teeth whitening to make teeth lighter has become routine as people seek to re-establish a more youthful appearance. Often, parents are concerned when their children’s primary teeth begin to fall out naturally (exfoliate) and are replaced by their permanent counterparts, because the permanent teeth are typically darker and more yellow than the primary teeth. In some cases, poor oral hygiene leads to plaque accumulation and extrinsic stains on the teeth, which may appear yellow in color. My teeth look gray. What causes that? Teeth which are gray in color are usually that way due to the incorporation of dark pigmented molecules into the hard layers (dentin and enamel) of the teeth during their formation. The condition is known as intrinsic stains. Tetracycline antibiotics are often the cause. My tooth seems to have darkened. What might have caused this? Teeth generally darken as a result of incorporating certain pigmented minerals or medications during their formation, or from saturation of iron from the bloodstream during periods of inflammation—such as occurs when there is trauma to the tooth. My teeth have brownish-gray spots or freckles on them. Should I be concerned? Frequently, teeth with brownish-grey spots that are uniformly distributed are diagnosed with fluorosis. There are other types of intrinsic stains which can produce this appearance, and a condition called enamel hypoplasias can also cause an irregular pitting/stained appearance in the enamel of one or more teeth. My teeth have white spots on them. Should I be concerned? 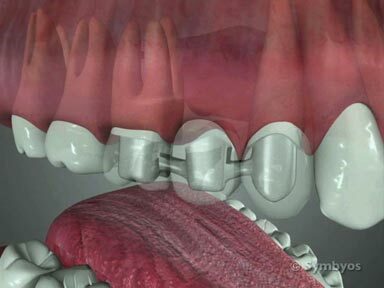 Learn more about tooth enamel demineralization. White spots on teeth appear as frosted areas of tooth enamel, and often represent the earliest form of tooth decay: tooth enamel demineralization. As plaque acids and acids from food and drink begin to dissolve tooth enamel, the tooth surface takes on an etched, matte appearance. 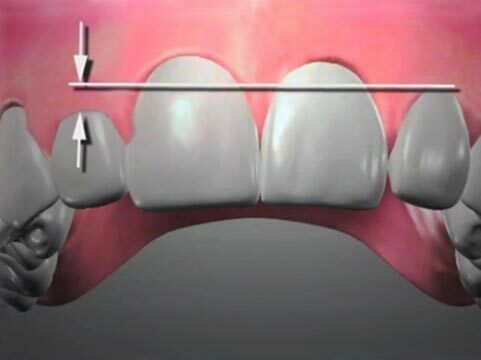 At a microscopic level, the smooth enamel becomes roughened and plaque adheres to it more readily. White spot lesions soon begin to pick up stain from coffee, tea, tobacco and food coloring additives. This may make them appear yellow to brown in color. Sometimes isolated white spots on teeth are due to enamel hypoplasias, which occurs during the formation of the tooth. They may also be due to excessive fluoride consumption during tooth development, a condition known as fluorosis.